Going keto doesn't have to mean going incognito. Learn how to balance your keto diet with your social life! You survived the dreaded keto adaptation phase and now enjoy limitless energy and mental clarity! Plus, your belly no longer looks like you're carrying twins as you rise from the dinner table. You're now an all-around badass. The diet that has you feeling like a rock star is cramping your social life. When nachos, pizza, beer, and other "carbage" are off your menu, it's not as easy to hang out with family and friends as it used to be. You're more selective about what you eat and drink because you feel on top of the world when you stay on plan. But simultaneously, you also don't want to become that person—you know, the wet blanket who can't frequent the same old haunts and hangouts. Don't despair! 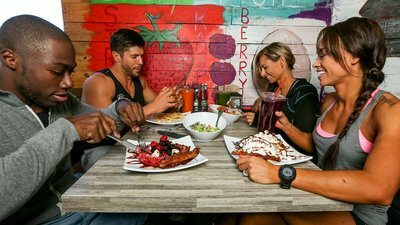 Dining out and maintaining your social connections doesn't have to be the death knell for the progress you've made since going keto. Whether you're at a fine-dining establishment, a fast food joint, or the corner bar, you're guaranteed to find something you can eat. Here's what you need to do to keep keto and be social. Many restaurants post their menus online now. Make your choices ahead of time so you won't be stuck deciding at the last minute, when the stress of the day might have you feeling "hangry" and more apt to choose something off-plan. Decide what makes sense for you to eat, and then order that. Don't let temptation derail your good intentions. Refer to the chart below with cuisine-specific recommendations to help you stay on track. Plan your meal ahead of time so that you're less likely to give into temptations last minute. Don't be shy about asking for substitutions. Now that low-carb and Paleo diets—not to mention food allergies—are so common, wait staff will usually accommodate special requests. (Plus, if they want a bigger tip, they'll be sure to help you get your order right!). No one will look at you funny if you ask them not to bring the bread basket, or request your cheeseburger with no bun. Most restaurants will substitute a side of green vegetables for potatoes, pasta, or other starchy sides that typically accompany entrees, too. They don't call it a beer belly for nothing. But that doesn't mean your keto diet has to turn you into a complete buzzkill. Distilled liquor (vodka, rum, bourbon, and gin) is actually very low in carbohydrates. It's the soda and fruity mixers you add them to that jack up the sugar. Both red and white wine are relatively low in carbs, too, with 4-5 grams per 5-ounce pour. Stay away from sweet dessert wines, and you'll be fine. A word of caution: The metabolic adaptations of a keto diet will have alcohol hitting you much harder and faster than you're used to. That's bad for obvious reasons, but a not-so-obvious one is that if you're three sheets to the wind, you're more likely to indulge in high-carb foods you'd otherwise avoid if your faculties were intact. Pace yourself, and pay even more attention than usual to the amount you drink. Alcohol hits you much faster and harder when keto. Drink (and eat) responsibly. Ketchup, barbecue sauce, and other sugar-laden sauces and condiments can be the undoing of even the best low-carb diet. Don't let blood-sugar bombs in the form of honey mustard and raspberry vinaigrette derail you. Stick with hot sauce, plain mustard, mayo, pesto, oil and vinegar, and nonsweet salad dressings like ranch and blue cheese. All herbs & spices, fresh or dried: garlic, oregano, basil, thyme, cumin, curry powder, chili powder, paprika, ginger, etc. Mexican: Fajitas, baby! Ditch the tortilla wraps, and you've got a pile of grilled meat (don't fear the fattier pork or steak) with onions and peppers, cheese, lettuce, guacamole, and sour cream to put on top. Perfect for keto. Middle Eastern/Greek: These places are known for their kebabs and meat skewers. Ask for vegetables on the side instead of rice, pass on the pita bread and hummus, and opt for a cheese plate. Indian/Afghan/Pakistani: Similar to Middle Eastern restaurants, these places will have deliciously spiced grilled or roasted meats, and maybe some coconut-milk-based curries. Also, Indian food tends to use thick, high-fat yogurt, not the sugary stuff, in many of their sauces. Avoid naan and potatoes, and you can easily "keep calm and keto on." Chinese/Japanese/Thai: These are tough, but not impossible. No rice, noodles, or tempura, so stick with grilled or steamed chicken, beef, or seafood; load up on veggies; and use soy sauce, hot mustard, wasabi, and other condiments in lieu of sauces that contain sugar, cornstarch, and other carby thickeners. Add butter, oil, or cream cheese to up the fat. No pad thai? No problem! Italian: Avoiding pasta doesn't mean saying arrivederci to your favorite trattoria. Go for steak, chicken, or pork chops, with broccoli or other vegetables in garlic and oil, or get a large entrée salad—and don't skimp on the olive oil. Don't let this become a religion. If you're doing keto to get to your ideal body comp, or to keep brain fog away and optimize health, a little somethin'-somethin' once in a while isn't the end of the world. Sure, it might temporarily knock you out of ketosis, but it will not undo the metabolic adaptation to fat burning you've worked for all the months or years you've been doing keto. If you are going to do some dietary off-roading, make sure it's worth it. Convenience-store doughnut? Not worth it. Grandma's famous marshmallow-topped sweet-potato casserole that she only makes at Thanksgiving? Worth it.Dynamite homemade baklava at a tiny taverna while you're on a once-in-a-lifetime trip to Greece? WORTH. IT.